Once again, here is our verse for this devotion series: "But the fruit of the Spirit is love, joy, peace, forbearance, kindness, goodness, faithfulness, gentleness and self-control. Against such things there is no law" (Galatians 5:22,23). As you can see in our verse, this week we're talking about peace. 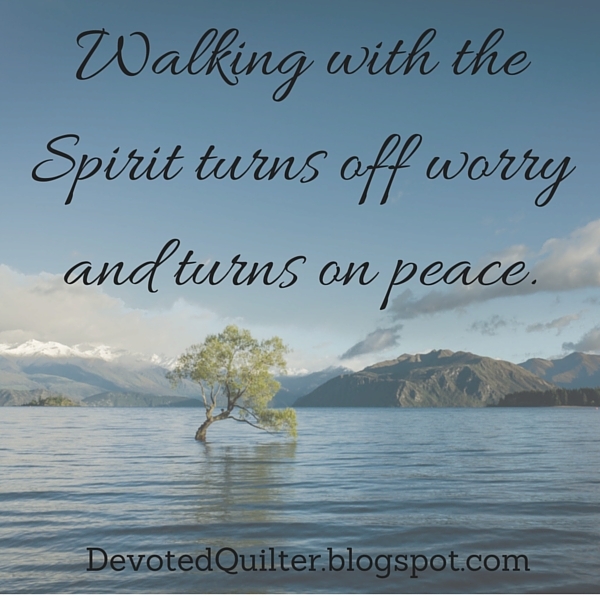 There are a lot of different types of peace that we could consider - peace in the world, peace in our families and peace with God - but as I thought about this week's devotion I kept thinking of peace within ourselves. I'm thinking about the kind of peace that comes when our minds are settled and relaxed, when we're not worrying over this, that or a million other things. We all worry. Some of us more than others, but we all do it at least some of the time. According to the Google dictionary, worry means "give way to anxiety or unease; allow one's mind to dwell on difficulty or troubles." Worrying means you just kind of camp your mind in your problems (real or potential) and stay there. The problem with worrying, of course, is that it really doesn't accomplish anything. It doesn't change our circumstances or prevent future trouble from finding us or provide us with something we're lacking. It only drains the energy out of today. Jesus asked, "Who of you by worrying can add a single hour to your life? Since you cannot do this very little thing, why do you worry about the rest?" (Luke 12:25,26). I've always loved that first question because it points out the utter pointlessness of worrying. No matter how much we worry, we can't change a thing about our lives. In Matthew 6, Jesus tells us again not to worry. Specifically, He tells us not to worry about our lives, about what we will eat or drink, about our bodies and about what we will wear (v. 25). Verse 32 says, "For the pagans run after all these things, and your heavenly Father knows that you need them" and that, right there, is the reason we don't need to waste our time worrying. God knows about the things we need. The antidote to worrying, as Jesus presents it? "But seek first his kingdom and his righteousness, and all these things will be given to you as well" (v. 33). Seeking his kingdom and his righteousness, to me, means trying to serve God to the best of our ability and if our minds are focused on that, then there's not much room for worrying. Focusing on serving God reminds us that while our worrying can't change one single thing about our lives, God can. Remember when Jesus asked if we could add an hour to our lives by worrying? He referred to that as doing a 'very little thing'! Doesn't that just shout about the power of God? It is a simple thing for Him to extend a person's life. He did it for King Hezekiah, in 2 Kings 6, adding 15 years to the king's life. If we want the fruit of the Spirit to grow in our lives, that means we will need to pay attention to the Spirit and sometimes that's going to mean turning off the constant worrying in our minds and choosing instead to focus on God, to walk beside His Spirit, so to speak. When we do that, we remember the power of God (for whom nothing is impossible! ), which calms the turmoil and pointless anxiety that could otherwise grip our lives. And that brings peace! Isaiah wrote, "You will keep in perfect peace those whose minds are steadfast, because they trust in you" (Isaiah 26:3). Perfect peace. That's certainly fruit worth growing! I have always wanted to make a whole cloth quilt, but I never thought I'd start with one this small! Make Modern magazine sponsored a mini mini quilt challenge on Instagram and I took a break from a couple of big projects to make this 5" square quilt. 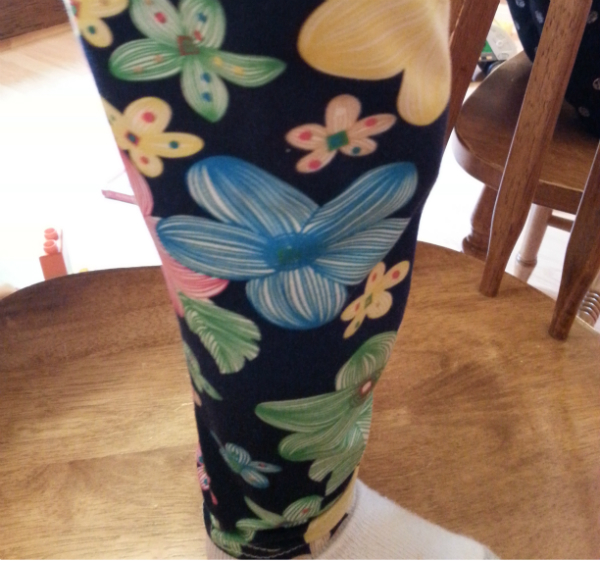 As many of you know, I babysit kids during the school year, and one day one of the girls arrived wearing these fantastic pants. This isn't very clear, but it was hard to keep her still long enough to take a picture! 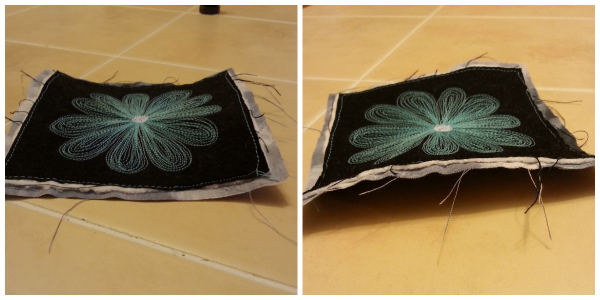 I spent the whole morning looking at the flowers and thinking, "I could stitch that!" 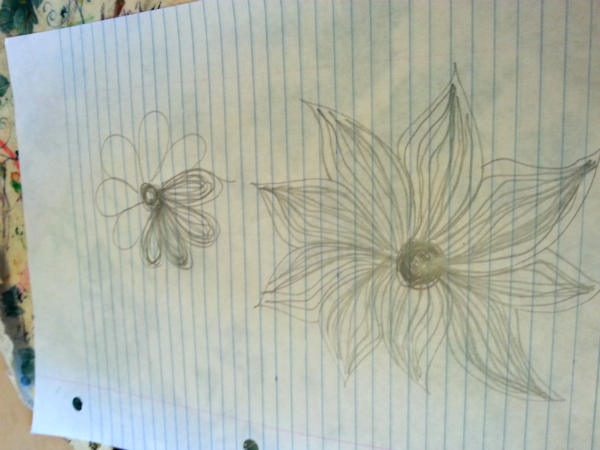 So, in the afternoon when the girls wanted to have some art time, I sat with them and sketched out a few versions of the flowers. 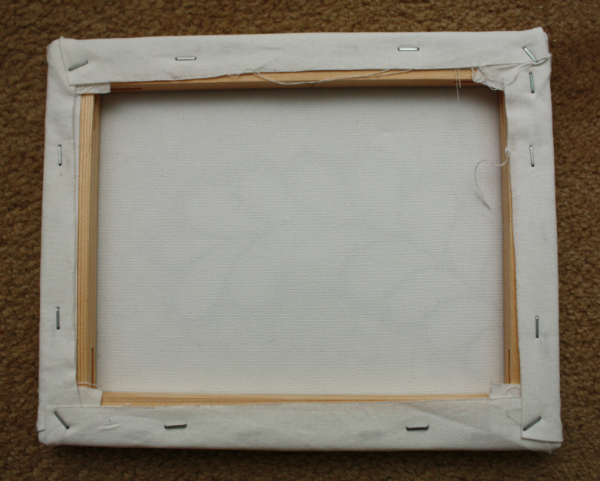 When it came time to stitch it, I drew the flower roughly with chalk, then free motion quilted the whole outline before filling in each petal. 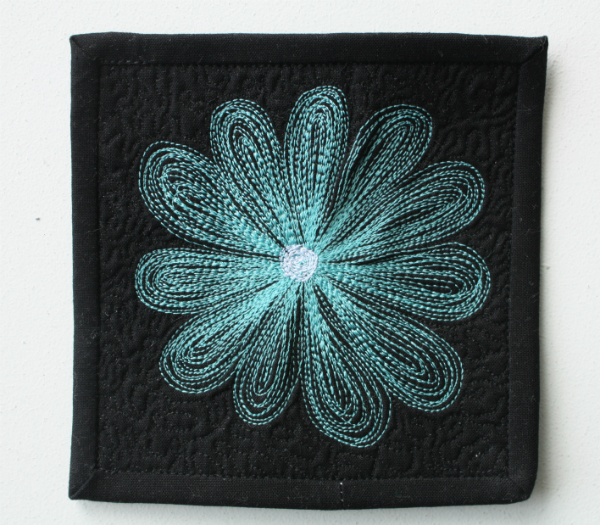 I really love the texture of the dense quilting in the center of the flower! If I were to do it again, I'd probably fill in every other petal, then go back and fill in the remaining ones as I found that there was a little bit of bunching as I worked my way around. You can just pick it out in the top middle of the picture above. I filled in the background with a micro stipple. 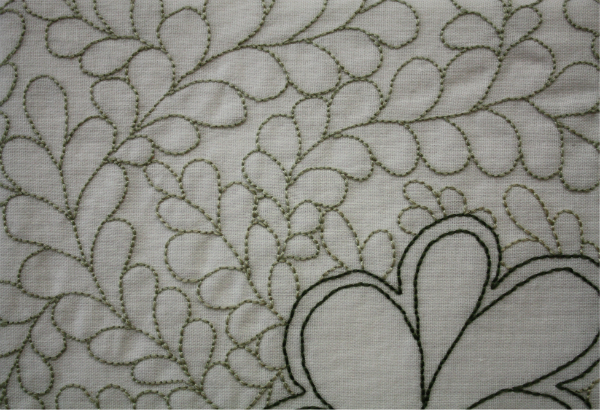 When I finished, this little quilt was anything but flat! Thankfully a quick bath and a night spent pinned to a styrofoam tray flattened it out perfectly. 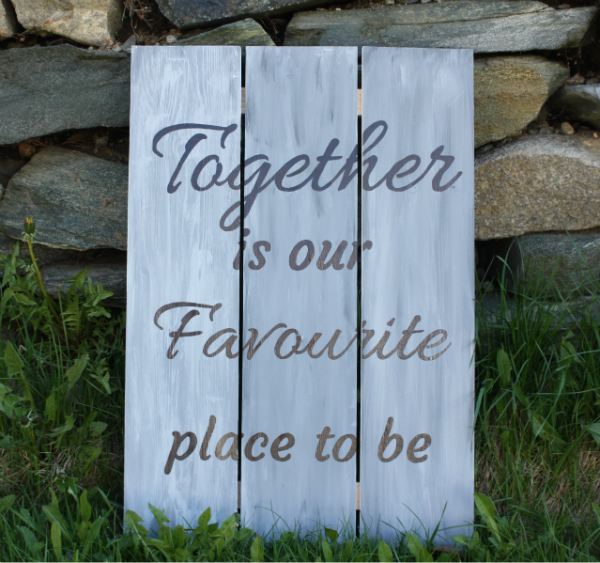 Linking up with Finish it Up Friday, TGIFF and Can I Get a Whoop Whoop. It's time for the third installment of our fruit of the Spirit devotion series! If you missed the previous devotions, click to read the introduction and about love. Today we will look at joy, but first, I want to tell you that I've put off doing a series on the fruit of the Spirit for months because I wasn't quite sure how to write about joy. Not because I don't think Christians should have joy, or because I don't have joy, or because I don't like joy :) No, it was simply a matter of knowing that there are people in the church who suffer from depression and who are sometimes made to feel that they would recover if only they were properly "spiritual." A wonderful speaker named Joanne Goodwin came to our church about a year ago and she talked about when she first started sharing her stories of depression and living with bipolar disorder. She said that there were people who told her she just needed to trust in the Lord for healing...all the while wearing eyeglasses to correct their faulty vision! I am in no way an expert or a doctor, but it is my understanding that depression is an illness like any other, both beyond the control of the person suffering and able to be treated with medication. I do believe it is possible for God to heal a person with depression, just as He can heal a person with diabetes or cancer or bad eyesight, but the truth is that He often allows us to walk through these things rather than healing us, and walking through something may mean needing medication. So, please, if you think you need help, talk to your doctor! Having cleared that up, here is our verse for this series of devotions, "But the fruit of the Spirit is love, joy, peace, forbearance, kindness, goodness, faithfulness, gentleness and self-control. Against such things there is no law" (Galatians 5:22,23). Remember I said before that this is not a collection of 9 different fruit that can be produced in a believer's life, but rather one fruit with 9 sides. The Holy Spirit can cause all 9 to grow together in a believer's life if we are willing to listen and obey as the Spirit prompts us to change our behavior. Aside from the fruit of the Spirit verse in Galatians, the first verse to come to mind when I think about joy seems like a rather odd verse. James wrote, "Consider it pure joy, my brothers and sisters, whenever you face trials of many kinds" (James 1:2). Now, I don't know about you, but I generally don't find that trials of any kind make me joyful! They tend to make me annoyed or sad or angry or scared, depending on what kind of trial we're talking about. There's not much joy in any of that, is there? Thankfully, James explains why we should consider trials to be 'pure joy': "Consider it pure joy, my brothers and sisters, whenever you face trials of many kinds, because you know that the testing of your faith produces perseverance. Let perseverance finish its work so that you may be mature and complete, not lacking anything" (vv. 2-4). In our humanity, what do we usually do when faced with things that aren't going our way? We complain, don't we? We complain and we grumble. Sometimes only a little and sometimes a lot. Sometimes out loud and sometimes only in our own thoughts. Either way, we are focusing on the negative, which is guaranteed to be a joy-stealer. Complaining and grumbling accomplish very little, if anything. They may make us feel better for a moment, but the feeling doesn't last. Those trials, though? They could be accomplishing something if we'd stop complaining and grumbling about them. James tells us that the trials are testing our faith, which will produce perseverance, which in turn will produce maturity. That sounds like cause for joy! We are not meant to find joy in the trials themselves. No one feels joy because of an illness or the death of someone they love or financial burdens or trouble at work. 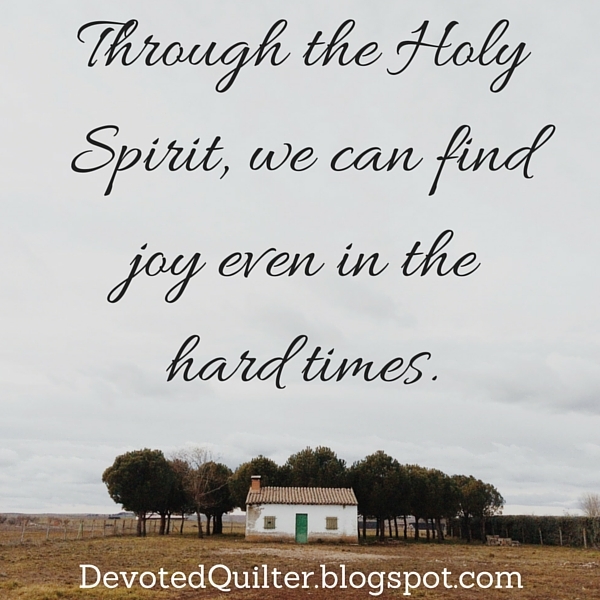 Obviously, it is only through God's Spirit that we can consider trials to be joy. If we are focused on Him, focused on enduring those trials while holding tight to our faith in His goodness and His faithfulness, then His Spirit will be at work in our lives. We will develop maturity as believers, and we will find joy even in the hard times. I started this embroidery project on May 7 of last year (according to Instagram) and I finally finished it last Tuesday night, exactly 13 months later. Good thing there are no penalties for taking a looooong time to finish a small project! I mounted it on an 8" x 10" artist's canvas I picked up at the dollar store. 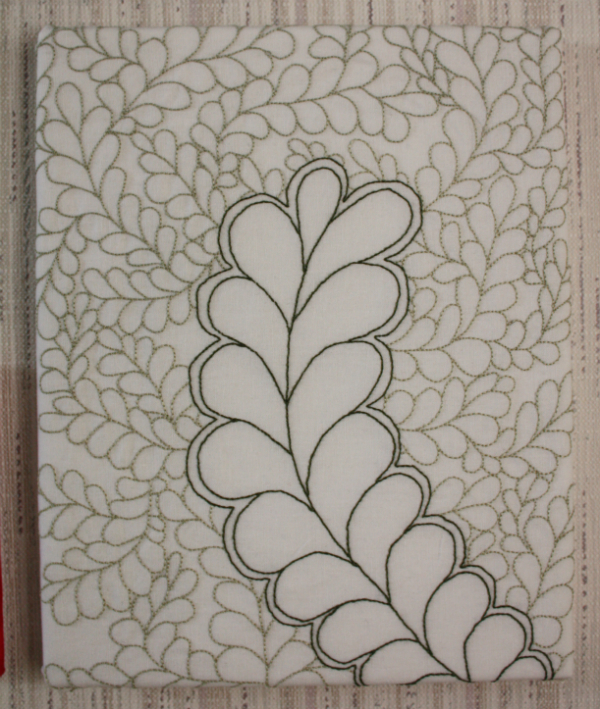 I originally drew the feathers intending to put them on a 6" x 8" canvas with the feathers wrapping right around the sides, but when I went to the store that size was sold out. Not thinking it would take me a year to finish, I bought the 8 x 10 size and hoped it would fit without me needing to redraw it. Thankfully it did, though the feathers don't wrap around the way I originally planned. I didn't think to take pictures as I mounted it on the canvas, but I'll try to explain my process in case any of you want to do it. If you have any questions, feel free to ask! First, I pressed it well then lay it face down on the table with the canvas on top. I pulled the middle of the two sides to the back and taped them down with painter's tape and did the same thing with the middle of the top and bottom. To fold the corners, I pulled the corner back first, making a triangle, and then I folded back the two sides. I held them in place with painter's tape too. After checking from the front that everything was smooth and positioned the way I wanted, I used a staple gun to secure the fabric on the back. Just as with my quilting, some of the feathers are rather questionable shape-wise, but when you stand back and look at it as a whole I think it works fine. This little embroidery was always intended to be for my laundry room mini quilt wall and, as it turns out, was finished exactly in time to be hung with everything else :) My laundry room has pretty much zero personality, so hanging all of my beautiful mini quilts seemed like the perfect upgrade. 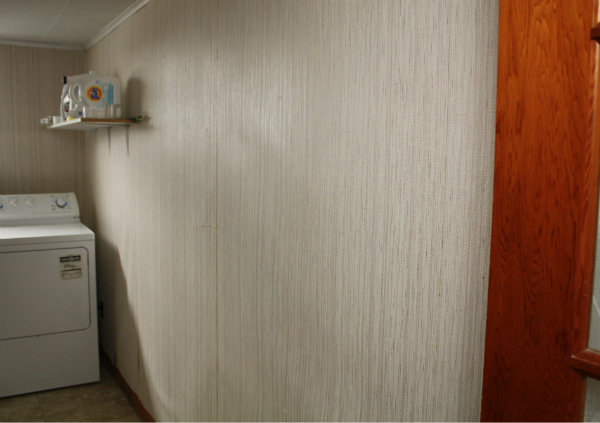 Also, this room is not only the laundry room, but also our pantry and the room we pass through to reach our wood-burning furnace all winter (and most of the fall and spring! ), so I am in this room a lot. That means I'll get to see these lovelies often. And After! Doesn't that look so much better? 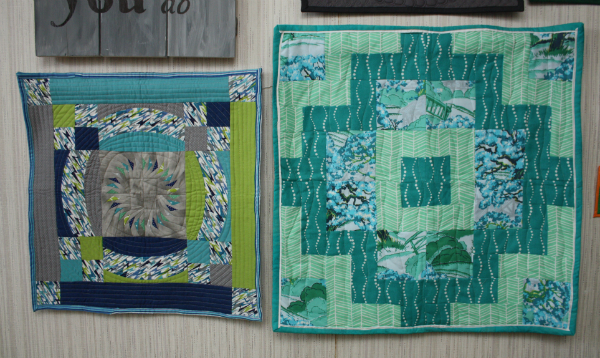 The gorgeous one on the left was made for me by Renee at Quilts of a Feather and I made the one on the right as a pattern test for Leanne at She Can Quilt. 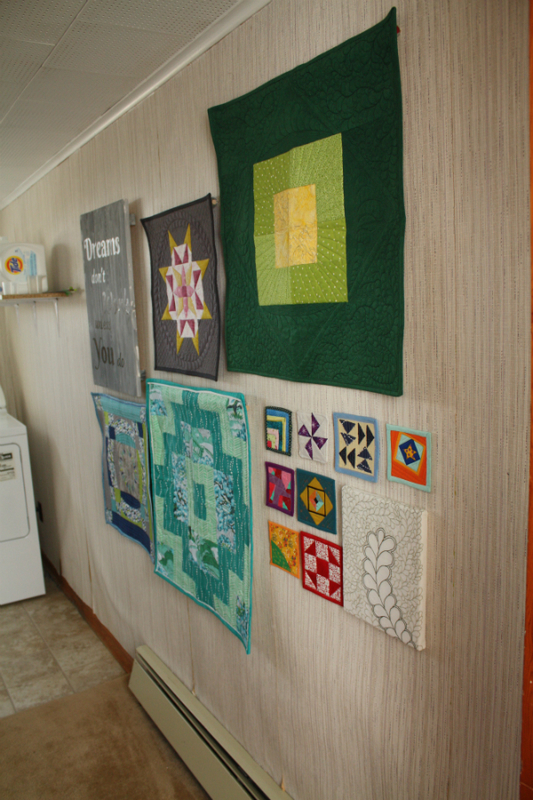 The one on the left in this picture is from the first round of the #igminiquiltswap. It was made by Crystollyn (@crystollyn on IG). Those flying geese in the center are TINY! 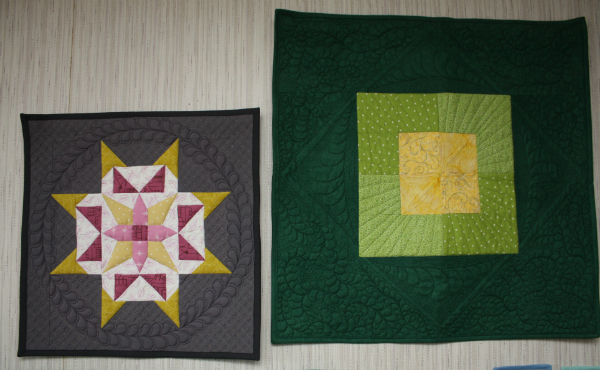 The one on the right is an angel quilt from the Schnitzel and Boo mini quilt swap (round 2, I think). It was made by Denise von Minden (@denisevonminden). 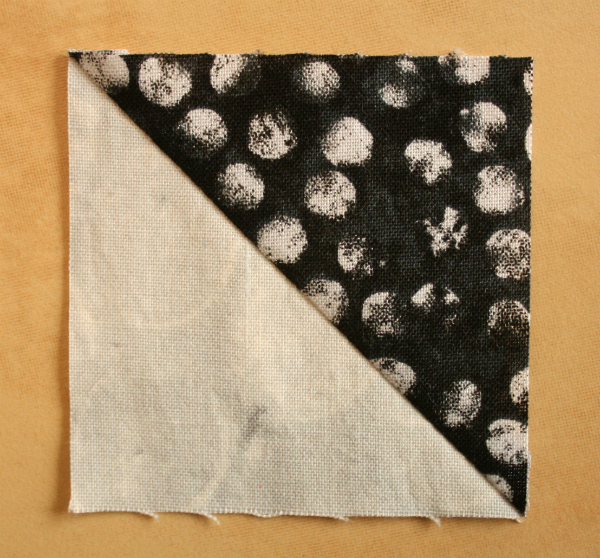 These mini mini quilts are adorable, aren't they? 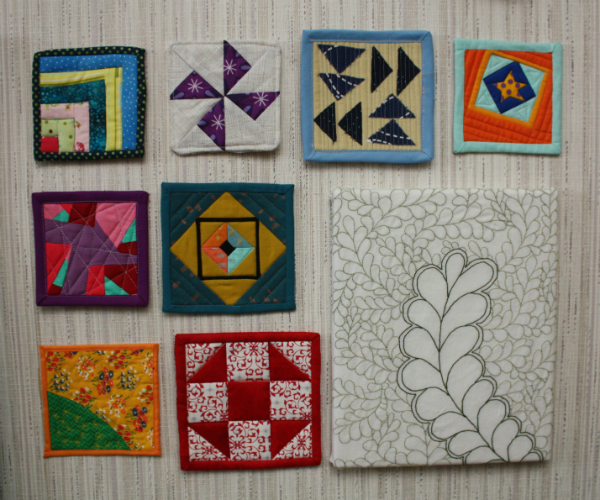 Going from left to right and top to bottom, these were made by: Kathy (@sewitsme61), Amanda (@whatthebobbin), Jennifer (@neverjustjennifer), Anja (@anjaquilts), Yvonne (@quiltingjetgirl), Jayne (@twiggyandopal), Erin (@lemonadefish) and Beth (@cookingupquilts). There's still room for more mini minis, so I plan to do more swapping soon! These have all been up for a few days and I love seeing them when I walk into the room! Welcome back to our devotion series on the fruit of the Spirit. This week we'll look at love, which is the first of the nine character traits that are listed as being the fruit of the Spirit. If you missed it, click to read last week's introduction to the fruit of the Spirit. Galatians 5:22,23 says, "But the fruit of the Spirit is love, joy, peace, forbearance, kindness, goodness, faithfulness, gentleness and self-control. Against such things there is no law." The character traits that the Spirit can cause to grow in us are ones that are not quite natural to us humans. Though we certainly do love people, we tend to love only certain people, the ones that we find lovable in some way. But that's not God's love. God's love depends on nothing. It just is...constant and given equally to everyone. In fact, "God demonstrates his own love for us in this: While we were still sinners, Christ died for us" (Romans 5:8). God's love is so big and so complete that He sent Jesus to die for us when we were in total rebellion against Him. We were each firmly seated on the throne in our own hearts, quite happily serving ourselves and completely ignoring God. Some of us were simply indifferent to God, others were openly hostile, but either way we were not lovable at all. Even then, He loved us enough to see past that rebellion to the relationship that would be possible if He made the way. That is the kind of love the Spirit can bring to our lives. The kind of love that sees past faults and difficult personalities. The kind of love that continues even in the face of insult or indifference. The kind of love that, quite frankly, we can't produce on our own. Jesus asked, "If you love those who love you, what reward will you get? Are not even the tax collectors doing that?" (Matthew 5:46). In other words, anyone, even a tax collector (the lowest of the low), is capable of loving the lovable and the people who love them back. It takes a special kind of person, one who is walking with the Spirit, to love everyone. I will be the first to admit that I often react with less-than-loving responses when faced with someone who is unlovable in some way. I am nowhere near able to get it right all the time, and it's those natural not-loving responses that prove I need the Spirit to grow God's kind of love in me. And how does this love grow in us? 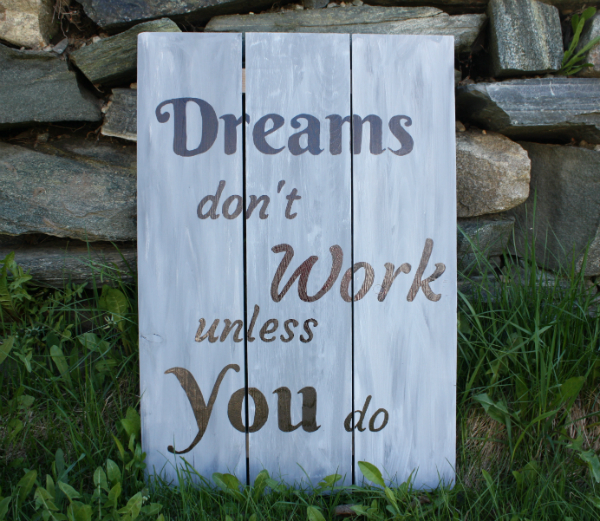 Galatians 5, verse 16 says, "So I say, walk by the Spirit, and you will not gratify the desires of the flesh." As I said last week, walking by the Spirit means listening when the Spirit prompts us to do (or not do) something, and then obeying that prompt. It's an ongoing learning process, a process of letting go of our own selfish desires and embracing what God wants for us. Jesus said in John 15:5, "I am the vine; you are the branches. If you remain in me and I in you, you will bear much fruit; apart from me you can do nothing." Remaining in Jesus means cultivating a relationship with Him. First of all, it means accepting Him as Savior, then it means spending time reading the Bible to get to know Him, it means spending time thinking about what we've read and learning to apply it to our lives and it means learning to be sensitive to the Spirit. Apart from a relationship with Jesus, showing true, unconditional love to everyone is impossible. 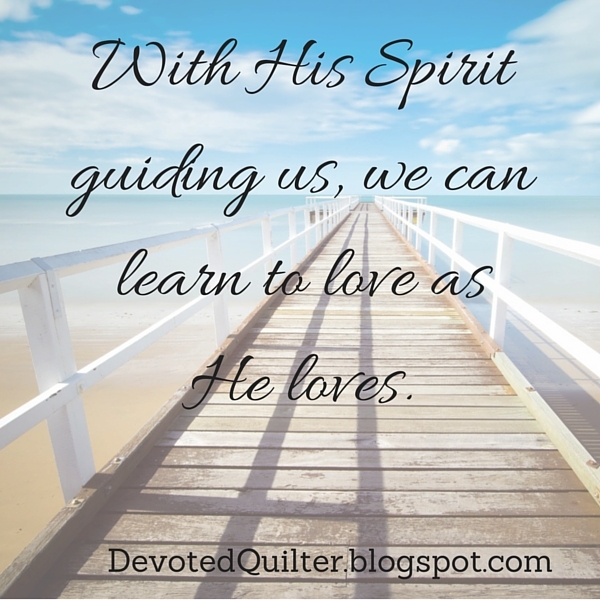 But with Him, with His Spirit guiding us and teaching us, we can learn to love as He loves. I am not much of a gardener, though I would absolutely love to have a huge vegetable and fruit garden. On Saturday I planted some rhubarb from a neighbor who was dividing his, so now I have that to go along with the strawberries I've been growing for a few years. I'm also planning to put in some tomatoes, once it warms up enough. Around here it's not safe for such tender plants for another couple of weeks. Newfoundland has a very short growing season! I've always wanted apple trees, but right now the yard is often used as a soccer field/football field/general running-around-with-friends-and-lightsabers field, so the apple trees will have to wait. Someday, though. 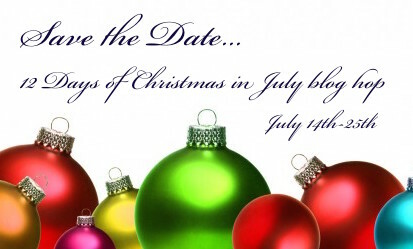 This week I'm starting a new devotion series. Rather than focusing on the fruit in my garden, we'll be focusing on the fruit of the Spirit, as listed in Galatians 5:22,23 "But the fruit of the Spirit is love, joy, peace, forbearance, kindness, goodness, faithfulness, gentleness and self-control. Against such things there is no law." This week is an introduction, and then each week, for the next nine weeks, I'll take an in-depth look at one of the character traits listed. Love, joy, peace, forbearance (or patience), kindness, goodness, faithfulness, gentleness and self-control. All nine are traits that we admire in others, traits that we wish we had in more abundance, am I right? Well, Paul is telling us that these nine character traits can be ours if we allow the Holy Spirit to lead us. Earlier in the same chapter, he wrote, "So I say, walk by the Spirit, and you will not gratify the desires of the flesh. For the flesh desires what is contrary to the Spirit, and the Spirit what is contrary to the flesh. They are in conflict with each other, so that you are not to do whatever you want" (vv. 16,17). It is not that we need to work harder to grow love, joy, peace, etc. in our lives. No, we need to walk by the Spirit, and as we do so we will begin to turn away from the things that are the opposite of these nine character traits. Walking by the Spirit means that we listen for the Spirit's prompting when we have decisions to make, even little decisions like "should I say this?" Even more importantly, we obey those promptings of the Spirit. I admit that there are times when I want to say something, but I feel like I shouldn't, but then I still say it anyway. That is not walking by the Spirit! If we are willing to walk by the Spirit, then these nine character traits will grow in our lives. Interestingly, though, they are not nine different fruit! The Greek word used in the original is singular, meaning all nine character traits are part of one 'fruit' which is produced by the Holy Spirit in us. That means that if we want to be fruitful, we can't pick and choose which traits we will grow, allowing ourselves to show love, while refusing to also exhibit self-control, for example. 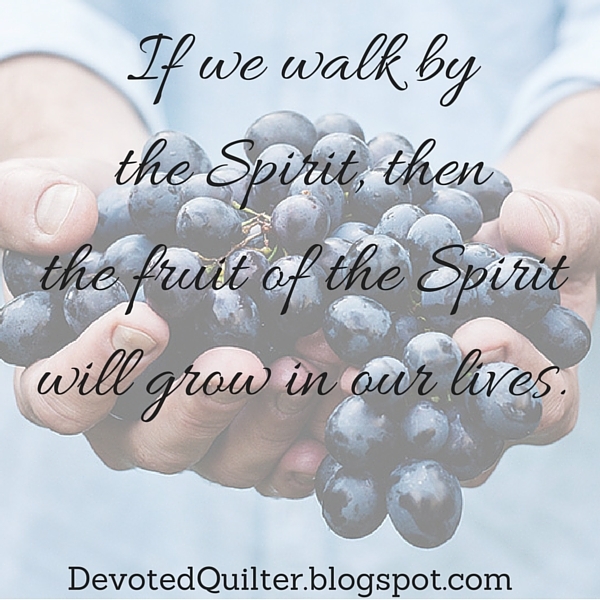 Though obviously we can live like that, we are not then properly allowing the Spirit to grow His fruit in us. There have been times when I've been picking strawberries and picked what looked like a perfect strawberry on one side, only to turn it around and discover the other side is still unripe, or has gone moldy or been eaten by bugs. Yuck! I only want to eat strawberries that are perfectly ripe and good all the way through. If we imagine the fruit of the Spirit as some exotic fruit with nine sides, then we want all nine sides to be equally ripe and free of mold! Love, joy, peace, patience, kindness, goodness, faithfulness, gentleness and self-control. This is the fruit I want in my life! 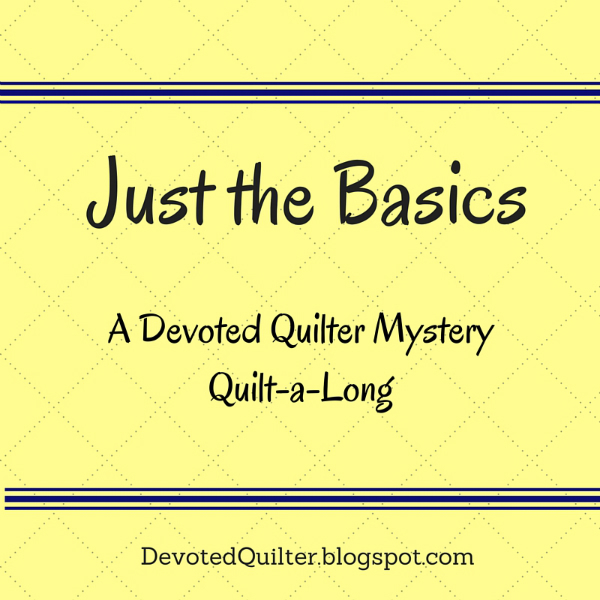 Welcome back for month 4 of the Just the Basics Mystery Quilt! 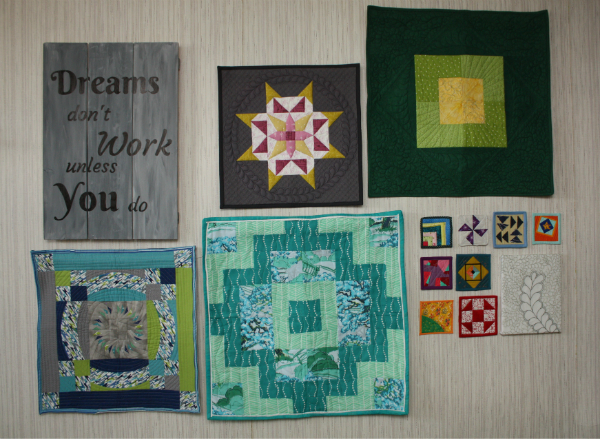 In case you're just getting started, March was fabric selection, April was HSTs and May was Flying Geese and Square-in-a-square blocks. Now let's get going! We're making HSTs again this month, but not nearly as many as we made back in April. This will be the last time we make HSTs for this quilt, I promise! 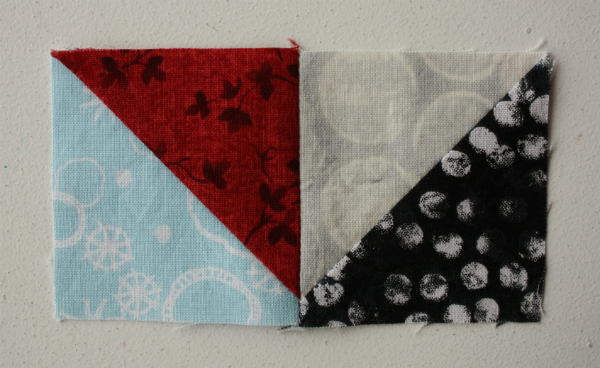 Then we'll join some of April's HSTs to this month's and your quilts will really start to take shape. 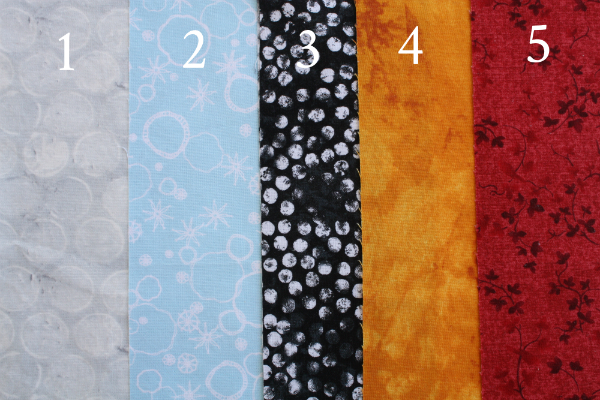 We'll be using fabrics 1 and 3 for our HSTs this month. In my fabrics, that means I'll be using the grey and the black. Once again, we'll be making these two at a time, chain piecing and making them larger than we need so we have room to trim them to the perfect size. For the baby/wall size, you need 64 HSTs. 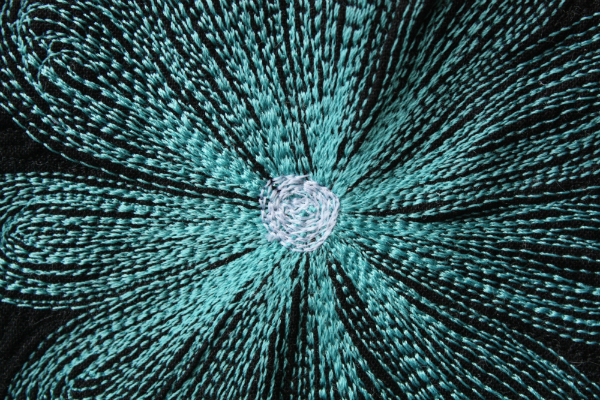 For the throw size, you need 120 HSTs. From fabric 1 - 32 squares 3" x 3"
From fabric 3 - 32 squares 3" x 3"
From fabric 1 - 60 squares 3" x 3"
From fabric 3 - 60 squares 3" x 3"
Rather than repeating the entire, in-depth tutorial I did back in April, I'm going to post a shortened version this month. If you want the in-depth version again, check out April's post. Choose your lighter fabric and draw a diagonal line from corner to corner on the back of each square. 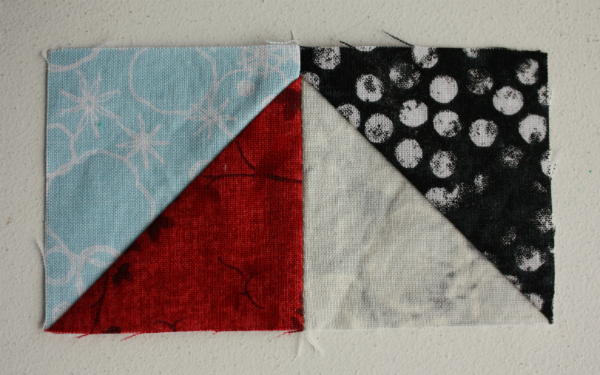 Pair each fabric 1 square with a fabric 3 square, right sides together. 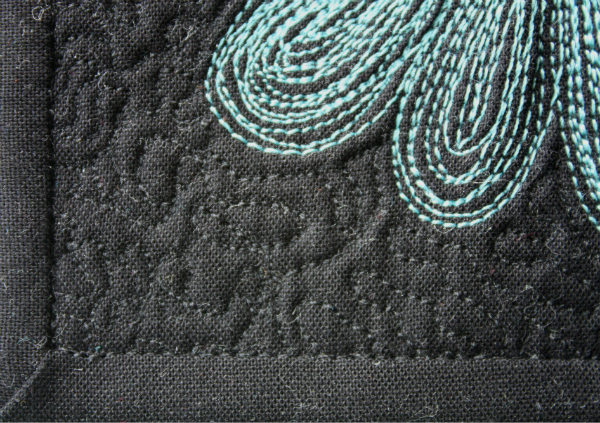 Stitch 1/4" away from the line on both sides. Don't forget to chain piece all of the squares at once to make the whole process faster! Cut apart on the drawn line. If you are using my method to trim, trim the blocks to 2 1/2" x 2 1/2" and then press them open. Otherwise, press the blocks open and trim using your preferred method. 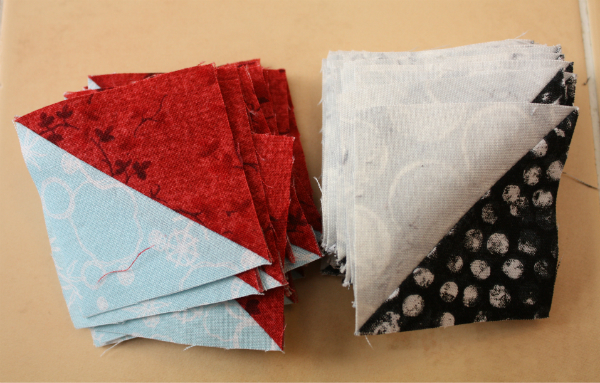 Now you have a lovely new batch of HSTs to use for the next step! You now have many (many, many) HSTs ready to be joined together. 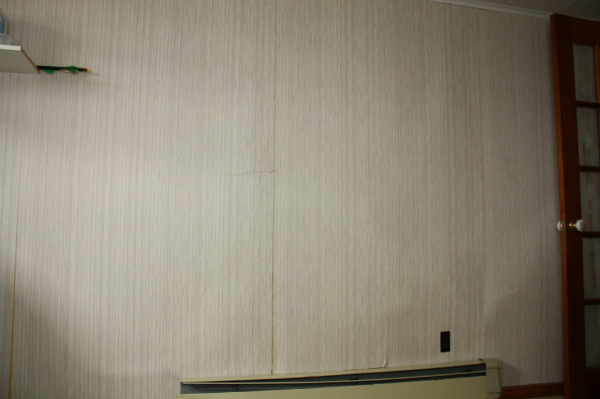 We'll be using the ones made this month and 64 (wall size) or 120 (throw size) from April. Units 1A and 1B are almost identical, except for the orientation of the HSTs, so be careful as you join them together. For both units, press the seam towards your fabric 5, which in my case is the red fabric. 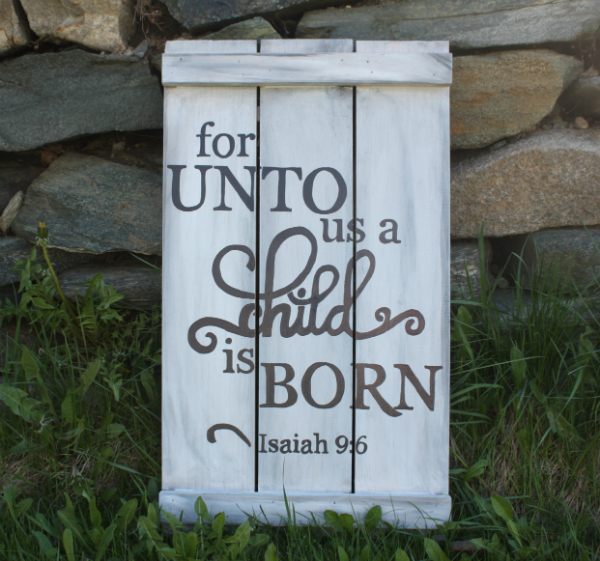 For the wall/baby size, you need 32 unit 1A and 32 unit 1B. For the throw size, you need 60 unit 1A and 60 unit 1B. Don't you just love the nice, sharp points you can get when you trim your HSTs? I certainly do!